19 kisses and counting! 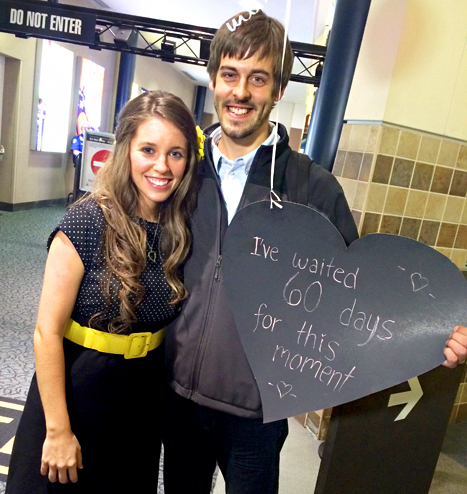 19 Kids and Counting star Jill Duggar and Derick Dillard (finally!) shared their first kiss at their wedding on Saturday, June 21. Take a look back at their road to the altar, including when they first met, when Derick knew Jill was his future wife, and details on how he proposed! The Arkansas natives grew up within 45 minutes of each other, but didn&apos;t meet until Christmas 2011. On the couple&apos;s wedding website, Jill recalled when Derick stopped by the home while caroling with a church group. "Neither of us remembers each other specifically from that time; all I have is a vague memory of the group of people who came," Jill wrote. "Not long after this, Derick contacted my dad and asked if he would be a prayer partner during his two-year term in Nepal." PHOTOS: How celeb couples first met! While Dillard was doing humanitarian work in Nepal back in 2012, Jim Bob Duggar served as one of his prayer partners. "We would talk every couple weeks or so to discuss how our work was going and what current prayer needs were," Derick wrote on the couple&apos;s site. Unbeknownst to the future couple, papa Duggar had a greater goal in mind for the two: marriage. "Jill&apos;s dad would also mention periodically the work Jill was doing in her studies as a student midwife and her desire to someday use her skills overseas on the mission field," Derick recalled, while Jill shared: "As my dad got to know Derick he was really impressed with his Godly character. He started telling me about Derick and also told Derick about me! I listened in on a few phone conversations with my dad without Derick knowing I was doing so." Derick wrote, "Being that we had similar life goals, she caught my attention." "The first time Jill and I spoke was over the phone in a brief conversation we had back in March 2013," Derick recalled. Added Jill, "Derick called my dad to give him an update and pray together and I happened to walk in the room. Unlike the other times when I had just listened in, this time my dad told Derick I had just come in the room and asked him to tell me a little bit about himself. We talked briefly that evening, however in the months following I didn’t think much about him." "I continued speaking with Jim Bob (Jill&apos;s dad) over the summer, but didn&apos;t speak with Jill again until August," wrote Derick. He did, however, use that time period, "praying about Jill and asking God for direction in getting to know Jill better." Derick said the answer to his prayers came at the end of summer, just before he embarked on a two-week trip to Japan. In one conversation with Jim Bob, the father of 19 gave Derick his daughter&apos;s phone number, and the two "began texting, then emailing, then Skyping/talking on the phone… Most of our conversations were centered around our values and life goals." Jill and Jim Bob visited Nepal at the end of November 2013, for a two-week trip. "I had no idea what to expect," Derick recalled, "but I was excited and prayed that God would give clear direction during this time." As the two spent time together abroad, Derick said he "felt the Lord directing me to ask Jill to officially begin a courtship relationship." Thankfully, wrote Jill, "I happily agreed!" "The more I spent time with him and observed his integrity, sweet spirit and love for God and service to others, the more I fell in love with him!" gushed Jill. After her trip to Nepal, Jill—apart from Derick for 60 days as he finished his work abroad—returned home and "cried a lot of tears; I missed him so much!" she wrote on their wedding website. "Finally, in January of this year (2014) Derick returned home and was able to meet my entire family!" 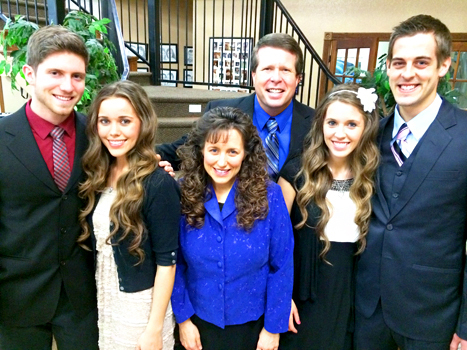 Derick added, "Upon my arrival home (January 2014), I was met by the Duggar clan." It was his first time meeting the Duggar family in person. "Over the next few months, I enjoyed spending time getting to know Jill and her family better." In classic Duggar family courtship style, Derick requested Jill&apos;s hand in marriage by approaching her father Jim Bob. According to ABC News, after Derick received permission, he reached out to a songwriter to help him prepare his proposal—complete with a song dedicated to Jill. "We went on lunch date to a Mexican restaurant and then we walked around in a park setting and the guy who wrote the song he was just sitting on a park bench," Derick told ABC News of the proposal. "[The singer/songwriter] was sitting on a bench, nothing out of the ordinary, and was like, &apos;Oh, hey, you look like a nice couple. I think I have a song for you guys.&apos;"
With no idea that a proposal was about to go down, Jill recalled to ABC how Derick "started saying a bunch of mushy stuff like, &apos;I love you so much,&apos; and I don&apos;t remember everything!" He then got down on one knee and presented his future bride with a "white gold band with a solitaire diamond: a round stone, .63 carats." Jill&apos;s response? "I said, &apos;yes, totally!&apos;" she wrote on the couple&apos;s wedding website. April to June 2014: The Two Hold Hands, Wedding Prep, and More! "We&apos;re just really trying to keep our relationship focused not on the physical but really just more on communication and continuing to learn more about each other," Jill told ABC earlier this year. "We&apos;re saving our first kiss and things beyond that for our wedding." Several weeks before tying the knot, Jill expressed on Twitter how glad she was "to be engaged to the most awesome guy in the world!" June 21, 2014: Married at Last — Plus, a First Kiss! The couple exchanged vows in front of more than 1,000 witnesses at the Cross Church in Springdale, Ark. After they were pronounced husband and wife, the in-love couple shared their first kiss.